Objective: Glide upwards to win in Color Switch: Challenges! This arcade game is loaded with addictive puzzles. Bounce into matching colors, collect stars, and touch the finish line. It's that simple! But, each new level has more obstacles than the last! 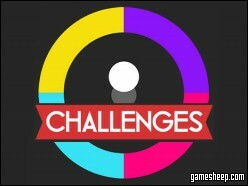 We are glad that you have chosen to play Color Switch: Challenges on GameSheep.com, the most dynamic website available. If you like this game Color Switch: Challenges don't forget to rate it and this way you will help with selecting only the best games for the home page.